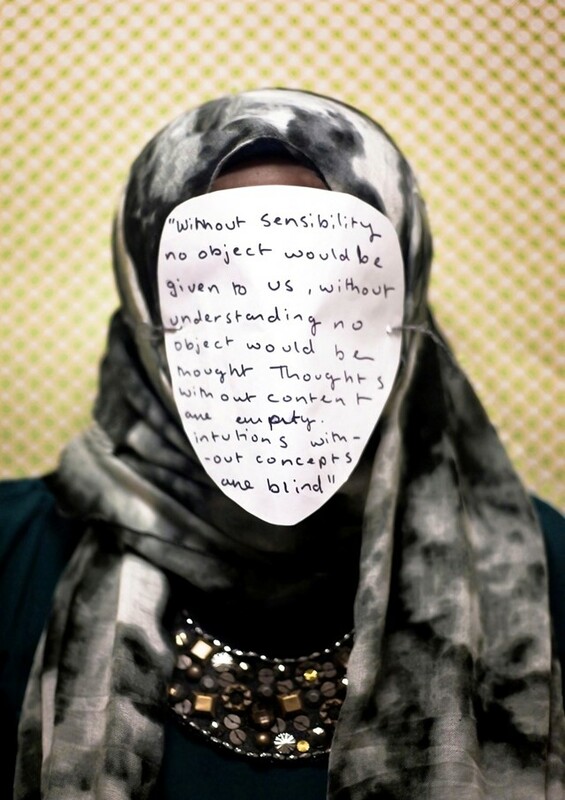 Catering to a Western audience, Jamal al-Lail’s Beyond the Veil series invites a timely, global look at the at-first confusing narrative between Kantian quotes and the masked faces of several colorfully-dressed Muslim women. The juxtaposition between their own vivacious stylings and the rigid epistemological references challenge our preconceptions about the modern role of the veil—as well as the individual underneath it. In Jamal al-Lail's case, expect no less than big-time personality, spiked shoulder pads, and a killer sense of fashion. Dazed Digital: What inspired you to take Beyond the Veil? Nasreen Shaikh Jamal al-Lail: When I started university, I got a lot of annoying and often hurtful questions like: ”Are your parents forcing you to wear a veil?” and ”Isn’t it contradictory that you’re wearing coloured scarves?” So in the Beyond series, I chose diversely coloured scarves, backgrounds, accessories, and to cover up the model’s face. Because to me, the face alone doesn’t curate identity: I wanted to take it away so people understood that there were different people behind the masks. That each is an individual, personal enounter. The quotes I used are from Kant, as I was really interested in ethics and how we make prejudgements about others before understanding their backgrounds. DD: In light of the UK’s recent veil controversy, where do you stand? Nasreen Shaikh Jamal al-Lail: I stand with the women wearing the niqab. They don’t get much support. This really saddens me. Is this really happening in the UK? Someone on TV recently claimed that because their faces are covered, they have no identity. They choose to wear it, so why are others stopping them from expressing themselves? Its ruining what I love most in the UK: freedom of speech. The veil issue only came up when a few political figures started pointing fingers. Its been blown way out of proportion. There are more major problems in this country right now. DD: Do most young Muslim women who wear the veil in the UK actually choose to? Is Beyond meant to be self-empowering? Nasreen Shaikh Jamal al-Lail: Females that don’t want to wear the veil don’t. Sometimes its the parents that don’t want their little girl to wear it, so she won’t become a target. Its empowering to me, because I get to voice my opinion. It’s really important that my work be relevant to both Muslim and non-Muslim women. It’s an overall global problem, when females are perceived as just their bodies. DD: How does your work debunk Western stereotypes of Muslim artists? Nasreen Shaikh Jamal al-Lail: Muslims tend to get clustered into the same circle. Each Middle Eastern region has got a particular designer that represents them. In Saudi, the black abaya has its own style and fashion brands. You’ve got ones with huge shoulder studs coming out, color-blocking—everything from electric blue or lime green to beige with sequins. Beyond the Veil was really inspired by this love of fashion and global trends, and the way I can integrate living both in the UK and Saudi Arabia. I am not repressed in any shape or form. My parents encourage me to be out there. My work directly contradicts the misconception that Muslim women can’t make art. DD: What influences you creatively? Nasreen Shaikh Jamal al-Lail: Saudi society is currently enouraging its women to become more forward. My generation is following in the footsteps of the older generation, who didn’t have the advantage of the internet and social media. I love the way Mona Hatoum expresses herself through artwork. She’s my biggest inspiration. Also, Mitra Tabrizian helped me enormously during my MA. DD: Any other emerging female Muslim artists we should look out for? Nasreen Shaikh Jamal al-Lail: My friend Eiman Elgibreen, who recently showed at Venezia Biennale. She pushes me. Nasreen Shaikh Jamal al-Lail's first solo installation, including her ‘Beyond the Veil’ series, is on view at the IHRC Gallery in London until February 18th 2014.